Download "Stone Soup," a fully-scripted multigenerational service on our Skinner House Companion Resources page. Across the country, our congregations are filling up with a new generation of Unitarian Universalists: children. Our congregations are reaching out to families as a whole. It's not enough, in these times, to provide stimulating sermons for adults and (in some distant wing of the church) solid religious education for their young ones. Rather, families need and deserve shared worship that they can experience together, take home, talk about and learn from. These multigenerational worship services draw from folk tales, children's literature and everyday living. Hewitt offers new ways to celebrate the beginning of the church year, Christmas, coming of age and Earth Day, as well as services for any time, to engage children through elders. Each service is a whole body experience, inviting members to participate and engage the mind, heart and spirit. These fully scripted services include recommended hymns, readings and props plus quick, at-a-glance descriptions that rate each service based on the preparation time required. Much of our collective anxiety probably arises from the incongruous models we have to work with. Our Protestant tradition is based on a worship model built around “The Word”: the heart of the service is often a lengthy sermon that may stir hearts, but is directed at minds. Congregants participate in limited ways. They sing, or read responsively, and perhaps they share joys and sorrows in front of the congregation—but, by and large, they sit still and listen. It’s not surprising that ministers and religious educators grow nervous when they contemplate adding a dozen or two worshipers with small, wriggling bodies and short attention spans. It’s a daunting challenge to craft a message that will speak to congregants at all points along the age spectrum. My first attempts at multigenerational worship followed a simple formula often found in our congregations: I stretched out the “Story for All Ages,” condensed the sermon into a brief homily, and added a fun musical piece to round it all out. None of the elements was qualitatively different from those in the adult service, however, and the results often fell flat. But through a combination of wise mentors, holy boldness, sheer stubbornness, and a long process of trial and error, I stumbled upon a new form of worship that encourages active participation rather than passive listening. Making a juicy story the focal point of the service removed the “veil” separating worship leaders from the congregation, and introduced a thematic arc for every element of the service from joys and sorrows to hymns to the offering. I learned that the right story can bring Unitarian Universalist theology to life, and creates room for spontaneity, playfulness, and reverence with a touch of irreverence. Here’s why this discovery seems so compelling: Across the country, our congregations are filling up with a new generation of Unitarian Universalists—families with young children. Our congregations are reaching out to families as a whole. It’s not enough, in these times, to provide stimulating sermons for adults and, in some distant wing of the church, solid religious education for their young ones. Rather, families need and deserve shared worship they can experience together, take home, talk about, and learn from. "Hewitt understands the need for careful and thorough preparation for worship which also leaves room for the spirit in the moment. 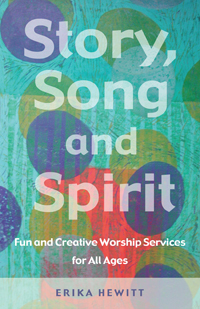 Her thorough directions on props, stage directions, transitions, and liturgical elements make all the difference in seeing these stories fully integrated into satisfying and creative worship services for all ages." "Woven together with a strong sense of liturgical rhythm, Hewitt brings together every element that today's multigenerational UU community needs to offer engaged and spirited worship."